LIBERAL, Kan. – Saints upcoming sophomore Isiah Small has been invited to the Juco Advocate 32 and Mullen’s Top 100 Camps this summer to showcase his skills in front of four year coaches. Small will be joined at the camps by incoming Saint transfer Tavion Robinson. The Juco Advocate 32 is an NCAA Certified even featuring the top 32 players from across the country. The camp will split the players into four teams of nine players, with each team playing three full regulation games. The event will run from July 11th through 13th at Eastern Florida State College in Melbourne, Florida. The Mullen’s Top 100 Camp features the top 100 players from across the country and will take place in Wichita, Kansas. 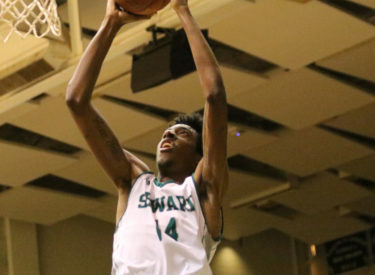 Small is coming off a freshman campaign that saw him lead the Seward squad in scoring, putting up 14.8 points per game, while connecting on 59.2 percent of his shots, good for fifth highest in a single-season. His efforts landed him on the All-Jayhawk Honorable Mention team. Robinson spent the 2017-18 season at New Mexico Junior College where he was fifth on the team in scoring, averaging 10.2 points per game. Two more Saints will be representing their National Teams this summer at the FIBA World Cup qualifiers. Mohamed Selmi will be playing on the Tunisia National Team, while incoming freshman Yarnden Willis will be representing Isreal.